The safer alternative for accessing goods vehicles. Complete with brackets and lock for on board storage. Step height adjusts for varying ground and load heights. Accessing the back of trucks or lorries can be challenging, especially access a side entrance, steps would be a convenient addition. 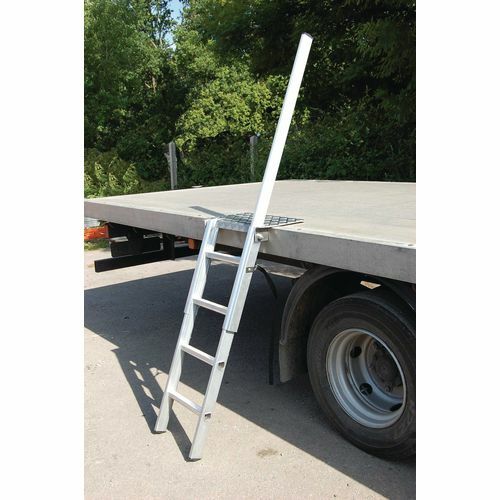 Our loading steps are a safer and easier alternative for accessing goods vehicles. They are available in a choice of two maximum heights; 1170mm or 1400mm and the step height adjusts for varying ground and load heights. There is a single folding handrail, providing support for the user and they come complete with brackets and a lock for on board storage. They also have an integral tie so the user can secure the ladder to the underside of the vehicle for extra security. They come with a 5 year warranty and they have a maximum load capacity of 150kg. Our loading steps are a great addition to a good vehicle, offering a safer, alternative way to gain access to the items inside the vehicle. They come with a 60 month guarantee and FREE UK Delivery.